Some Atlanta Movers can make moving a smooth and efficient process, while others can only make the relocation experience more grueling than it already is. For instance, one company might hide fees from you until it is time to pay, only heightening stress levels. Or, you may have some of your fragile possessions broken when hiring a moving company that fails to treat your belongings with adequate care. At Bulldog Movers, we strive to provide excellent service at a fair, competitive price, and we always put our customers first. Our Atlanta movers strive to make moves free of stress by handling everything for you from start to finish. We provide timely service and will lift, load, transport, unload, and setup your belongings in your home for you, professionally and efficiently. If you’d like us to pack your belongings for you, we can do that as well. We always take great care of our customers’ possessions and make it a priority to have them protected by offering custom crating services and driving moving trucks that are outfitted with air-ride suspension. Also, if you need any storage space before, during, or after your move, Bulldog has plenty of space available. We have a 40,000-square-foot facility that is dry, secure, and climate controlled. 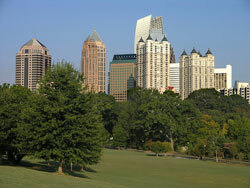 This is just another way our Atlanta movers provide stress-free moving services. To find out about all the different moving and relocation services our Atlanta movers offer residents throughout the Metro area and beyond, please call or e-mail Bulldog today.